Kattappana (Kerala), September 18th: The purple-blue neelakurinji is in bloom again in parts of the hilly grasslands of Munnar. 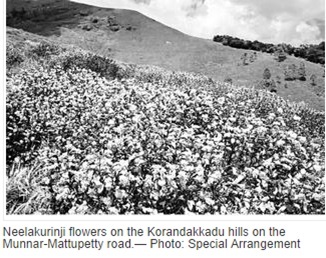 The flower-covered hills are drawing scores of tourists, especially to Mattupetty and Gundumalai. Though neelakurinji ( Strobilanthes kunthiana ) flowers appear only once in 12 years, there are many sub-species with blooming cycles varying from once in a year to once in 16 years. The kurinji is now in bloom in areas where it flowered in 1990 and in 2002. However, in Rajamala, the flower is not to be seen. It was in 2006 that these hills were awash with the flowers. The kurinji is in flowering mode in Mattupetty, Kundala, Thenmala, and Devikulam Gap. Of the 200 varieties of Strobilanthes found in Asia, the Munnar hills host 45. Though they all look blue from a distance, the period of flowering varies with different species. The topographical and climatic conditions may effect changes in the flowering period of the neelakurinji, a native to the shola forests of the Western Ghats. The neelakurinji has three growth phases — a two-month-long flowering and seeding period and then the decaying phase. Biologists say it is not linked to seasonal changes as in the case of other flowering plants. Residents say there were signs of the blooming a month ago, and with the sun out, the kurinji has been flowering widely.